She's the five-time Victoria's Secret model known for her impeccably toned figure. 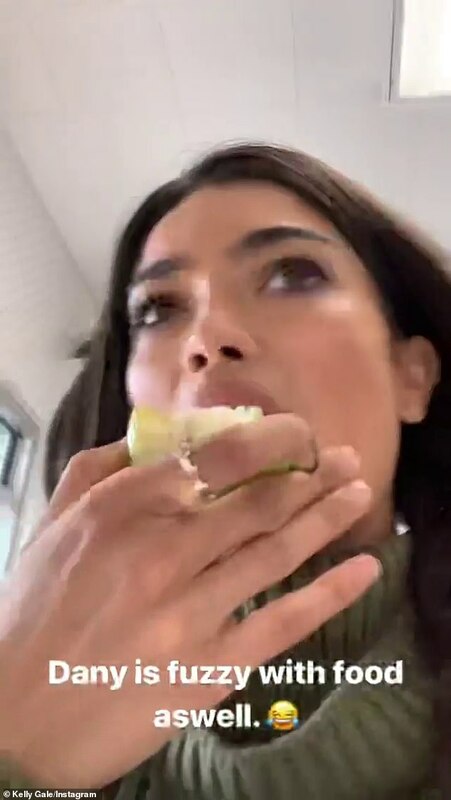 But Kelly Gale may have taken her fitness routine too far on Wednesday after she was accused of being insensitive by exercising outside an In-N-Out burger restaurant. A video posted to Kelly's Instagram showed her arriving at the restaurant with friends before eating fruit instead of ordering food inside. She then launched into a workout in full view of customers entering and leaving the restaurant. Kelly wore skintight activewear including a sports bra and cropped leggings which highlighted her slender physique. While skipping and performing core exercises, several passers-by could be seen looking at Kelly rather quizzically. The fact she was positioned directly outside the front entrance to In-N-Out Burger meant several patrons had to walk around her. In the caption, she claimed there were 'no excuses' when it came to healthy living and encouraged her fans to squeeze in workouts whenever possible. She added: 'Not gonna pretend I was eating here'. 'This is low key kinda f**ked up,' another person wrote. 'Were you trying to guilt-trip their customers,' one social media user asked the model. After Kelly finished her workout routine, a friend apparently bought her 'every vegetable they had in the store'.